2016 marks the thirtieth anniversary of FM's debut 'Indiscreet', an album best known for its enduring singles 'That Girl', 'Frozen Heart' and 'American Girls', but also home to equally superb deeper cuts such as 'Other Side Of Midnight' and 'Face To Face'. Never really completely happy with the original 1986 production, the current FM line-up took time out during pre-production of their forthcoming new album to re-record their debut in its entirety and have just released it, complete with an additional seven bonus tracks, as the appropriately titled 'Indiscreet 30'. A founding member of FM, bassist Merv Goldsworthy chats with Fireworks about recording in Ibiza, borrowing Phil Lynott's bass, and his love of playing five-a-side football, come rain, shine... or snow! [chuckles] It was for purely selfish reasons that we've re-recorded 'Indiscreet', as when it came to [second album] 'Tough It Out' we had the production budget firmly in place and felt that we'd got it right on that record; we'd only been together for four months prior to recording 'Indiscreet' and we felt that we didn't make it the way that we really should have. It was started in Ibiza, some of it was done in Surrey, some in Chipping Norton. I remember us going to lots of different studios and scrapping it, then starting it anew, then remixing it, and by the time we were finished it was just a case of "get the bloody thing out!" We've looked back on that experience ever since and I'm not sure we've ever been totally happy with it. As a fan, I've personally never found 'Indiscreet's production too bad – particularly when listening to the 2012 Rock Candy remaster by Andy Pearce. Granted, it was never going to give Mutt Lange sleepless nights, but it's almost become de rigueur amongst commentators to say that the original is poor sounding. That's why 'Indiscreet 30' doesn't sound massively different, we were happy with the songwriting for example – it's just the way that it was originally executed and recorded. That said, we understand why people love 'Indiscreet' in its original form; I feel the same way about say Thin Lizzy's 'Jail Break', it's not their best produced album but that doesn't mean I like the songs on it any less. So does 'Indiscreet 30' feel to you like taking care of unfinished business? Yes, I think that's it. We've played the album in its entirety enough times, so we knew the songs thoroughly and we didn't want to do another DVD so we just thought, "let's just give it a go and see what happens." We knew as soon as we started recording it that this is how it's supposed to sound. We're not trying to spoil the original for anybody – it was just such an easy process to re-record it. The way I view 'Indiscreet 30' is as a companion piece to the original, designed to compliment rather than replace. Yeah, that's a good way of looking at it. Your bass certainly sounds more prominent on the new recordings. Yes, it's more even across all of the tracks as it was all recorded during the same session this time. The original sessions were recorded in four different locations over the course of two years and on lots of different basses, whereas this time it was done on the one bass. We didn't want to change 'Indiscreet' too much, we just wanted a nice, crisp production. Anyway, it's done now – we won't be re-recording 'Tough It Out' though, I can guarantee you! You don't need too, it's peerless in the FM catalogue! You play a five string bass these days, perhaps that's partly responsible for the difference? Yes, five string basses weren't around in the 'Indiscreet' days, in fact I used Phil Lynott's Ibanez bass for much of those recording sessions. Gear was thin on the ground back then and he was kind enough to lend it to me – you can hear me playing Phil's bass on the original versions of 'Other Side Of Midnight' and 'That Girl'. On all of the re-recordings, Steve [Overland, FM vocalist] sounds as wonderful as ever. Yes, he's always had that great voice; it's such a joy to share a stage with Steve. It's weird you know, I've heard him sing 'That Girl' a million times but every single time I just think, "wow, that's better than he's ever sung it before!" Lets move onto the additional bonus material on 'Indiscreet 30'. The previously unreleased track 'Running On Empty' has a delicious bass-driven mid-tempo vibe about it. Yes, it's like 'Hollywood Nights'. That song was left over from the 'Heroes And Villains' sessions. Regarding the bonus tracks on 'Indiscreet 30', we wanted to give our fans as much rare and requested out-of-print material as we could fit onto one disc – I think there's just forty-five seconds spare! 'Love And Hate' made only the double vinyl release of 'Heroes And Villains', and not the CD or MP3 formats. Yes, it's a bit dark for us! We weren't entirely sure about it for the standard release but it's one of those songs that fans were requesting, and so we've responded by making it more widely available. 'Bad That's Good In You' originally appeared on the 'Futurama' EP; the version on 'Indiscreet 30' sounds like an alternate mix featuring the keyboard embellishments of Jem Davis more prominently. I liked the original – this take sounds even better. You called it exactly right, that's the story with that particular song. Steve wasn't completely happy with the version of 'Bad That's Good In You' on the 'Futurama' EP, so parts were added and it was remixed. 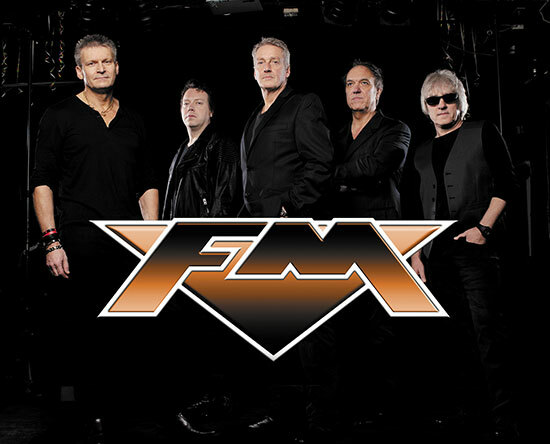 I would personally define FM as a cult band, as unlike your 80s peers Def Leppard and Bon Jovi, where everybody knows some of their songs, those who know FM really know FM – how does that feel to you as a founding member of the band? Some of our fans we've known most of their lives! You know, we hadn't performed in Italy, Spain or Greece back in the original days of the band and so it seems strange that we have these fans in places we'd never been to. We're never really bothered about the size of the venue as long as it's full and you've got that special energy. You recorded 'Indiscreet 30' during the sessions for the new FM album, what can you tell Fireworks readers about that one? We've done six backing tracks which we've put the guitars on so far and we're hoping to have it done by Spring. Jim's brought in a song that has a 'Digging Up the Dirt' vibe, and we have a couple of more AOR-style songs in the works too. Merv, it's been a pleasure. Finally, tell Fireworks readers something about yourself that they're unlikely to know about you? Well, at fifty-seven I still get as much pleasure playing five-a-side football as I do playing gigs. Outside of the band that's my one constant: pouring rain, snow, whatever – I'll happily play a game!